The New England Patriots and New Orleans Saints held a joint practice yesterday in preparation for Thursday’s preseason game, and received a visit from a special guest. 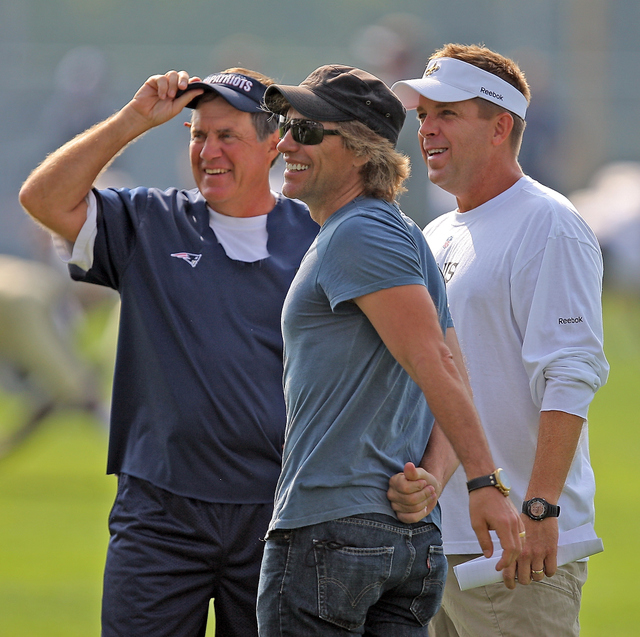 Jon Bon Jovi, a good friend of Patriots head coach Bill Belichick and lead singer of the aptly titled band ‘Bon Jovi,’ made an appearance and chatted with Belichick and Saints head coach Sean Payton. No, your eyes do not deceive you. That is a smile on the face of Bill Belichick, which is to my knowledge the first piece of photographic evidence revealing the Patriots head coach does feel emotion. According to Payton, it was during a Bon Jovi concert in Dallas that Saints GM Mickey Loomis called and offered him the Saints head coaching job, which he promptly accepted. Actress and singer Hilary Duff is engaged to hockey player Mike Comrie of the Edmonton Oilers, although he’s not her only sports connection. Duff, a Houston native, was recently seen out and about sporting a Texas Longhorns shirt. I guess she’s just as excited for college football as the rest of us. A wedding date for the couple has yet to be announced. It seems like hockey players are all the rage this summer, as singer and former American Idol winner Carrie Underwood married Mike Fisher of the Ottawa Senators back in July. Access Hollywood correspondent Maria Menounos is known as being a die-hard Boston Celtics fan, but last night we found out she is capable of doing much more than just watching sports. Prior to the Hall of Fame game, the NFL preseason opener between the Bengals and Cowboys, the Madden NFL 11 ‘Pigskin Pro-Am’ was held on NBC. There was a mixture of celebrities and former athletes on both teams, but it was Menounos who came away with the MVP, sacking Kurt Warner in the process. Quinton Aaron, aka Michael Oher from The Blind Side, and The Office star Craig Robinson provided some bulk for each team. Jerry Rice and Joe Montana along with Warner came through with the veteran support. Now that Terrell Owens has been claimed, Shaquille O”Neal is undisputedly the biggest name remaining on the free-agent market of washed-up future hall of famers in any professional sport. So with some time on his hands the Big Aristotle made his way down to one of his old team’s cities, Phoenix, where a certain teen pop sensation was performing a concert. Not being one to back away from a once in a lifetime opportunity, Shaq made his way to the soundcheck before the concert and got a chance to show Justin Bieber his vocal skills. I won’t be the one to judge the big fella’s talent, but I was able to surmise the following from the minute-long video: Shaq loves Justin Bieber just as much as any pre-teen girl in America. Samuel L. Jackson may be one of the most powerful people in the entertainment industry, so when he tells you to do something, you do it. When he tells you to jump you not only ask how high, but which direction. So, Atlanta Falcons fans, when Samuel L. Jackson tells you to “Rise Up,” you subsequently “Rise Up,” because that’s what Falcons do, isn’t it? They rise up. Just watch the video, complimented by a synchronized choir. International icon David Beckham’s soccer career may be winding down, but that doesn’t mean he’s going to fall off the map. One of Beckham’s best buds is actor Tom Cruise, who reportedly wants him to give the movie industry a try. According to Cruise, Beckham “has the looks” to make it in Hollywood. Beckham may have the looks and personality to take on Hollywood, but can he actually “act,” that is the question. Rapper Lil Wayne may be in prison for charges stemming from gun possession, but that isn’t going to keep him from channeling his inner sports analyst. 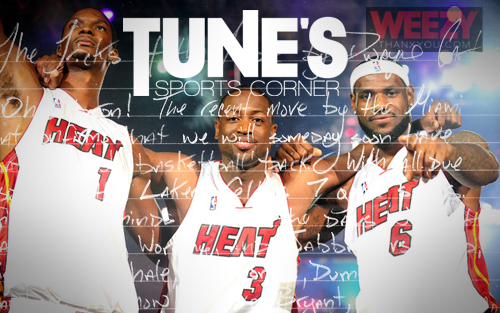 The hip-hop star took to his blog to break down the Miami Heat and their revitalized roster. Seems like he knows what he’s talking about, excerpt from the post below, unedited. I believe that this Miami team will be explosive as intended. Anything less than an NBA championship title will be uncivilized. 72-10 anybody?. Well with Wade at the 1 and Lebron at the 2 or vice versa even, or Mario Chalmers at the 1, Wade at the 2, and Bron at the 3… Wow! Not to mention that I didn’t mention Bosh, who can live at the 4 or 5. Zone defense will be a must against this team. That’s 3 players on the court that commands a double team. Just imagine those guys on a fast break, the defender back peadaling… Wade can take it to the hole or throw it up and you know Bron. Bron is going to get it… or dish it back to a trailing Chris Bosh who will definitely finish at the rim… again, wow! Or how about Wade at the 3-point line, Bosh setting the pick, and Lebron in the passing lane. And if you collapse on them, don’t forget that Chalmers can knock down the shot. I bet that they lead the league in alley-oops. And they’re all young! Scary! Hey, what if Pat Riley returns to the sidelines and it ends up being the Lakers vs. Heat in the finals? Riley vs. Jackson! Epic! Gasol on Bosh, Ron-Ron on Bron-Bron, and Kobe on Wade… wow! Weezy also took on the Bulls, Celtics, Knicks, Timberwolves, and Warriors. I did however begin to question his knowledge of the game when he used the words “stacked” and “Milicic” in the same sentence, regarding talent as opposed to construction work. Golfer Mike Weir held his “Mike Weir Charity Classic” on Monday, and the celebrities and athletes were prevalent. 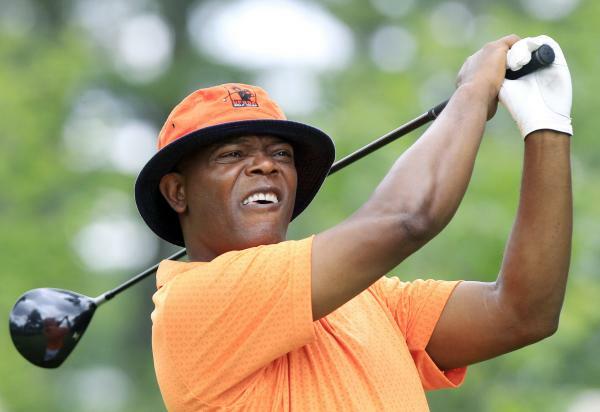 Samuel L. Jackson was the biggest star present, taking to the course in what looked like an outfit inspired by John Daly. Hockey studs Dion Phaneuf, Martin Brodeur, and Steven Stamkos also participated in the event, as did Entourage actor Kevin Dillon. That being said, Jackson does not take golf lightly. The actor is known to include clauses in his acting contracts that guarantee him tee times between filming. No word on how the stars performed, but if the outfit is any indication Jackson was in for a good round. It worked this past weekend for Daly. The newest sports movie to hit the pre-production stage, titled Moneyball, is a story that tracks the Oakland A’s baseball team and its unconventional general manager Billy Beane, played by none other than Brad Pitt. Beane is infamously known for using computer-generated analysis of statistics to draft players, which brought the A’s organization success both on and off the field. The script was rewritten by Steven Soderbergh in an attempt to include more authentic scenes. Darryl Strawberry and Lenny Dykstra will both be making appearances in the movie. The film also stars Jonah Hill, Robin Wright, and Philip Seymour Hoffman. They have begun shooting scenes of real day and night games at the coliseum to include in the movie. Last night during the ESPYs we witnessed actors Steve Carell and Paul Rudd spoof LeBron James’ “The Decision,” where Carell tells Rudd an important decision of his own. The two actors are promoting their new movie “Dinner for Schmucks,” and did brilliantly in the skit below.